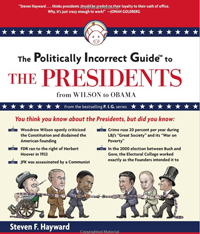 Steve Hayward, a scholar with the Hoover Institute, wrote a valuable book on Presidents from Wilson to Obama titled The Politically Incorrect Guide to the Presidents: From Wilson to Obama: Grading The Chief Executives on the 'Constitutional Curve'. Hayward makes the point that liberal historians essentially write history and activist leaders like Woodrow Wilson and Franklin Roosevelt are often listed at the top of the list of great Presidents and conservative Presidents are often dismissed or, in the case of Harding, simply disparaged as one of America’s worst Presidents. Government activism is hardly a sign of greatness in Hayward’s mind and he notes that many of those Presidents actually diminished our liberty. Hayward viewed not just these President's accomplishments but how they viewed the Constitution, and even measures their Supreme Court justices. Based on those criteria, Republicans are often graded higher, thus upsetting many liberal readers. While many readers may not like Hayward's perspectives, he is discussing measures that are often ignored and shouldn’t be. If they were, we would view Presidents differently and maybe we might actually have more balance in not just judging Presidents but in advocating policies since many of our policies are often designed based on past historical records. If the Historians miss the mark on what is important in a Presidency, it could easily be argued that it also has a damaging effect upon policy if we learn the wrong lesson of history. Calvin Coolidge receives Hayward highest mark of the Presidents measured and for good reason. Hayward states that "liberal historians have reviled and belittled" Coolidge "even more than Warren Harding or Herbert Hoover, chiefly because Coolidge is a more formidable figure who presents the most serious challenge to the pretensions of Progressivism.” Coolidge graduated from Amherst College where he studied history and the classics and what often is missed from historians' perspective on Coolidge is both his sense of humor and intelligence. Conversant with both Greek and Latin, Coolidge was one of the most cultured men who occupied the White House. Coolidge even wrote his own speeches and was the last President to do so nor can anyone say that America did not prosper with his handling of American affairs since he led the country through a period of prosperity and peace. Our founding fathers would view Coolidge as an ideal President. His handling of the post-World War I was a complete disaster as he dissed the Republicans whose cooperation he needed and whose modifications of the League of Nations were reasonable. In a book review, Historian David Kinchon noted, “Hayward was preaching to the choir when he wrote of this icon of the Democratic Party: I had read books by Nicholas Patler, historian Sidney Bell, who taught at West Virginia's Concord College, William C. Bullitt and others that presented this contrarian -- to conventional wisdom -- view of Thomas Woodrow Wilson, so it didn't take much convincing by Hayward for me to agree with the assessment.” As for Wilson's massive violation of civil rights, Kinshon added, “Wilson’s disregard of the Bill of Rights and the right to protest, led to the creation of the American Civil Liberties Union by Roger N. Baldwin in 1920, three years after Baldwin and others who opposed the entry of the U.S. into the European conflict were deprived of their constitutional free speech rights. That alone will cause many conservatives to spite Wilson! Historians gloss over Wilson’s trampling of the protests, blaming it on his notorious attorney general, A. Mitchell Palmer, but Wilson, his second wife Edith Galt Wilson and his equivalent of Karl Rove, Col. Edwin House, knew what they were doing.” Wilson made it clear in his academic writings that he disparaged the Constitution in which he swore to defend. If there was President who deserved an F, it was Wilson. While many would disagree with Hayward's ratings of Harding and Hoover but I would agree with Harding rating despite the corruption that occurred in his administration. Have you ever heard of the Great Depression of the 1920’s? Of course not, but then that is because of Harding's handling of the economy. Harding inherited an economy as bad as Reagan inherited from Carter or Obama did from Bush with double digit unemployment and high taxes. You could even make the case that he inherited a worse economy and he put together a policy of tax cuts, and budget cuts that led to a decade-long prosperity. Harding was one of those underestimated Presidents who understood that he was not the smartest guy in the room but he surrounded himself with a strong cabinet of his era including Herbert Hoover, Andrew Mellon and Charles Evan Hughes. His policy worked and when you compared what Harding did with a serious recession with what Obama has done, there is no comparison. Harding showed to be a better President and if there is a reason that this present recession is the worse since the Great Depression, it is because Obama simply did everything wrong to deal with the recession he inherited. In the case of Herbert Hoover, I am not willing to agree with Hayward since the C he gave Hoover should have been much lower simply because Hoover did the wort job of any President in managing a recession since he turned it into a Depression. Much of the New Deal had its origin in the Hoover Administration as he attempted an activist government approach, and it not only didn’t work, but when combined with the Federal Reserve mismanaging monetary policy, he not only started the Great Depression, but his policy encouraged a more activist approach by Roosevelt. Roosevelt was trained as a progressive but ran to the right of Hoover in the 1932 election. Just as Obama ran as a middle class tax cutter and budget restrainer in the 2008 election, Roosevelt ran as a budget cutter in 1932. That lasted as long as he took his oath of office. Hoover became the conservative outside of office and as Coolidge once quipped, “Hoover gave me a lot advice, all of it wrong.” Coolidge proved to be a good judge of Hoover. Hayward is an admirer of Reagan, having written a two part biography of the man and let’s be blunt, even if you manage to consider all of Reagan's mistakes, there was no doubt of his greatness. Reagan is still influential since much of his policy has proven superior to what is presently being done and highlights the economic mistakes of George Bush including Bush’s spending which lead to a bigger government than he inherited. Carter got his F and was deserving of it and Obama is working on his F with all deliberate speed. There are others that can be debated. Truman was a liberal domestically but his success in foreign affairs led to a bipartisan policy in cold war policy and Eisenhower stated that his two biggest mistakes sat on the Supreme Court but he was a successful President since he managed America through a time of peace and prosperity. Hayward pointed out the narcissism of Bill Clinton but Clinton did do one thing right after the 1994 election debacle, he retreated from his wife leftist agenda and moved to the center. Peter Schweizer detailed some of Clinton’s policies on bailing out of banks in the 1990’s that would lead to the financial collapse. After 1994, Clinton essentially surrendered to Reaganonmics with budget restraint, welfare entitlement reforms and capital gain tax cuts; something that many Clintonistas fail to mention about their President. And just as forgotten were the Clinton’s mistakes that would lead to disaster long after he left office and escaped blame. Hayward dissects the Kennedy administration while he is willing to give Kenney a C- , he does his job in demolishing the Kennedy legacy, but it should be noted and Hayward does, John Kennedy was a Cold War Democrat who was willing to pass tax rate reductions that became the model for Reagan tax cuts two decades later. There was a time when both Parties viewed tax rate reduction as options to revive the economy. The recent Obama deficit commission was a return to the Old Kennedy-Reagan theories that tax rates matter but Obama has pretty much ignored his own commission. Class warfare is more fun for leftists like Obama. This book is a great read and will challenge how we think about the Presidency for Hayward understood that our Founding Fathers had a different view of what constitute greatness in the Presidency. The modern politician using taxpayer dollars to bribe voters with their own money and the constant demagoguery that emanates from many of today's politicians would have our Foundering Father rolling in their graves. The recent Obama war on the Catholic Church to force the Church to pay for birth control pills as part of their health insurance despite being against their beliefs shows that we live in a society in which free birth control is a right and freedom to practice one religion is not. This explains why many fear for our future and why Hayward’s book is a book that Americans should read. You are right! Calvin Coolidge is one of our most underrated presidents. He deserves to be remembered and remembered well. Assuming office upon the death of President Warren Harding, he served from Aug. 2, 1923 to Mar. 4, 1929. Here is an overview of his presidency. Coming into office after the Great War and the chaos that followed it, President Coolidge sought to return the country to a peacetime basis—“normalcy,” as Warren Harding, his predecessor, called it. He refocused the government on executing its core responsibilities and made it function efficiently, effectively, and economically. If there was one thing Coolidge knew how to do, it was to make each taxpayer's dollar sweat. In doing so, he made maximum use of the newly created Bureau of the Budget. On his watch, the massive war debt was paid down and taxes cut or eliminated for most Americans….He presided over an exciting and vital decade—marked by individual freedom and bursts of creativity—that ushered in the modern age. It is worth nothing that Coolidge was our first radio president, welcoming the new medium and making full use of it. Most Americans had never known a period of such prosperity and well being….Internationally, Coolidge, who was never an isolationist, saw the role of the United States as a democratic model for other nations. While minding its own business, as Coolidge would put it, the United States offered a helping hand to nations in need, as in the case of the 1923 Japanese earthquake and in providing expert technical assistance to governments on financial affairs. He worked for peace though naval reductions, while seeking to bring about the reign of international law in his support for World Court membership and the Kellogg-Briand Treaty. The Coolidge Administration also sought to revive international trade by helping to restore the international gold standard…. Coolidge was a man for his time. His popularity steadily increased throughout his presidency. Re-election would have come easily for him in 1928 if he had chosen to run. At the end of his term in March of 1929, his work done, Calvin Coolidge packed his grip and returned to his home in Northampton, Massachusetts, there to live out his remaining days among his friends and neighbors.